This example demonstrates how to use CellDecorationStyleSelector property to set custom background to the grid cells depending on a property from the model. To style the text in the grid cells, you have to use the CellContentStyleSelector property. Now we have to implement a class that inerits the StyleSelector class and override its StyleSelectorCore method in order to provide custom logic for cell Columns\HowTo. 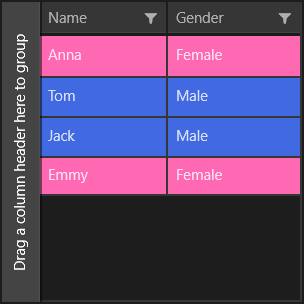 In this example it will provide different styles depending on whether the data item's Gender is Male or Female. Let's add an instance of the CellStyleSelector class to the page resources that will be used by the CellDecorationStyleSelector property of the grid and set its style properties. We have to set the Style properties with TargetType="Rectangle". As we expect: when the item is Female, the background is pink; and when the item is Male, the background is blue.